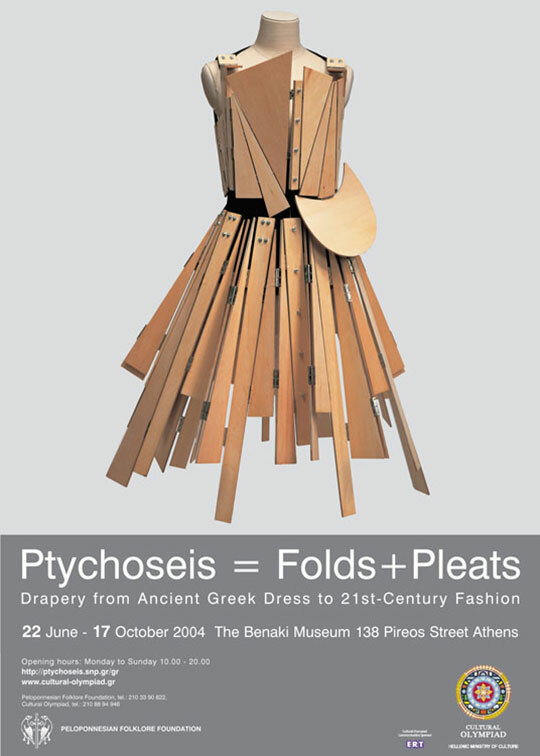 The Peloponnesian Folklore Foundation (PFF), aiming to create an international landmark in the field of costume-study, organised the exhibition “Ptychoseis= Folds and Pleats. Drapery from ancient Greek dress to 21st Century Fashion”. The project was part of the official programme of the Cultural Olympiad 2001-2004, organised by the Hellenic Culture Organisation S.A., the organising body of Cultural Olympiad 2001 – 2004 and supported by the Hellenic Ministry of Culture. The exhibition provided a unique opportunity to visitors to explore the aesthetic qualities of the plasticity of drapery through selected works of art of the classical period of Ancient Athens, regional articles of clothing from all around the world (Ethiopia, India, Africa), as well as high fashion and ready-to-wear creations by contemporary designers, such as Mariano Fortuny, Madeleine Vionnet, Issey Miyake, Rei Kawakubo, Alexander McQueen, John Galliano and Hussein Chalayan among others, all coexisting in the same exhibition space with attires of the Maasai and authentic ancient Greek sculptures. The ”Ptychoseis= Folds and Pleats. Drapery from ancient Greek dress to 21st Century Fashion” exhibition wouldn’t have been realised, if it hasn’t been for the support and kind loans from many Institutions/Museums, such as: Benaki Museum (GR), Kent State University Museum (US), Kyoto Costume Institute (JP), MoMu – ModeMuseum Provincie Antwerpen (BE),Mudam – Musée d’Art Moderne Grand-Duc Jean (LU), Musée de l’Homme (FR), Musée Galliera – Musée de la Mode de la Ville de Paris (FR), Musée de la Mode et du Textile (FR), National Archaeological Museum (GR), National Historical Museum (GR), The Metropolitan Museum of Art (US), Victoria & Albert Museum (UK). Vassilis Zidianakis was the Artistic Director of the exhibition and co-curator, along with Mrs Ioanna Papantoniou, President of PFF. On this occasion, Atopos cvc commissioned Marcus Tomlinson to direct ‘Infusion’, a video that features a man wearing the traditional Greek, white, pleated, male skirt – the fustanella.